At every step of production, care is taken to honor taste and quality. 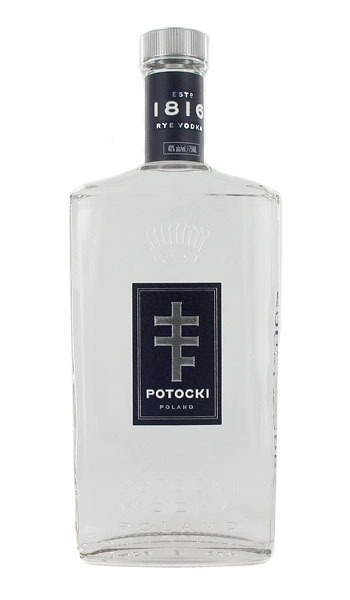 The result of this artisanal process is an aromatic yet smooth vodka which clearly stands out against industrially produced alternatives.Potocki Wódka is created from the highest quality rye sourced in fields around distillery in central Poland. Fresh from the harvest each August, the grain is milled, and cooked under pressure. Yeast is then added to start fermentation yielding a low alcoholic strength mash. The mash goes through two slow distillations in a column still. It is regularly tasted until the optimal distillation level is reached. The “head” and the “tail”, that is the initial and final ends of the distillate, are discarded to ensure high quality as their taste characteristics are not optimal. The resulting pure alcohol (96.4% abv) is mixed with distilled water to the required bottling strength of 40% abv. No additives, such as citric acid or glycerine, are used. The common process of charcoal filtration is intentionally omitted as this would unnecessarily strip the vodka of its character. The faint bouquet of vodka is noticeable on the nose, but most of the action takes place on your palate. Good vodka can be flavourful enough to take it over and keep you entertained for a good half a minute, Potocki does that. At first it is soft and slightly sweet on the tongue. Its rich texture envelops the mouth, gradually arousing the taste buds, and you can soon see yourself ordering dinner and asking for a refill. While you are still toying in your mind with various menu options, the flavour moves to the back, turning into a long dry finish with nutty notes which are the trademark taste of Polish rye vodka. This pleasant experience is concluded by a warm feeling in your chest (and your heart). British Class Magazine notes that its “creamy, nutty, rye notes combine with a hint of spice to deliver an incredibly long finish”.